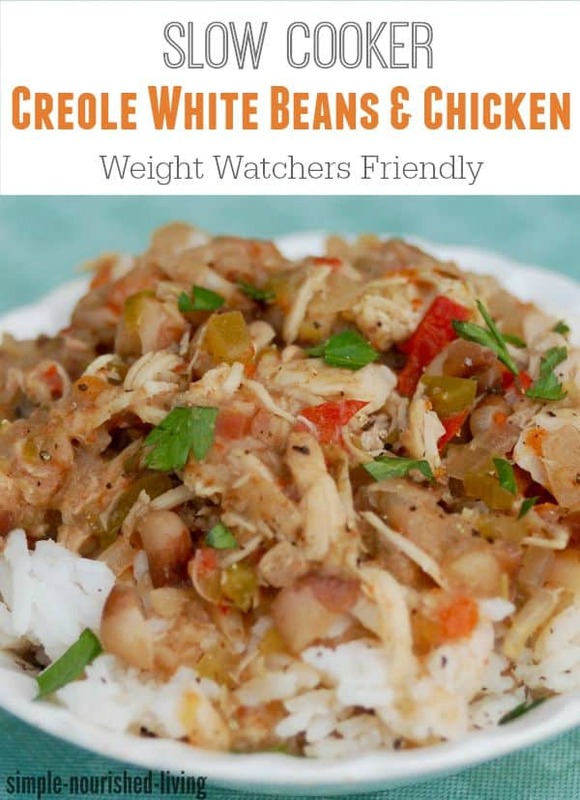 This easy, healthy and delicious recipe for skinny slow cooker creole white beans with chicken is adapted from this one on Budget Bytes, which the talented Beth made on her stovetop. It looked simple and good. Just chicken, beans, an abundance of colorful chopped vegetables and a few spices. 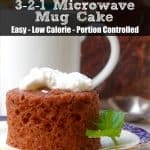 Perfect for Weight Watchers and almost Simply Filling. I changed up this recipe a little. First, I tossed everything into the slow cooker instead of tending to it on the stovetop. 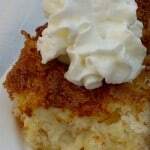 And I made a few minor ingredient adjustments so it would work with what I had on hand. Since we are not a fan of overly spiced food, I cut back on the amount of Creole seasoning. And I was also able to skip the oil because everything just got tossed into the slow cooker without pre-cooking in a skillet. There’s quite a lot of chopping required for this recipe, which is not a problem if you’re like me and find chopping vegetables relaxing. 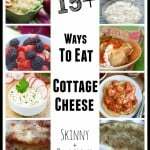 If you don’t, you may want to cut them up the night before and place them in a zip-lock bag or covered container in the refrigerator, so in the morning everything is ready to go. It you can’t find Zatarain’s or Tony Chachere’s Creole or Cajun seasoning blends, you can use this recipe to make your own. If you opt to make your own, just be aware that the store bought blends contain a quite a bit of salt, so you’ll need to add salt to your beans after cooking to compensate. This recipe makes a big batch, about 12 cups, of Creole White Beans and Chicken, plenty to share and/or freeze for individual ready-to-go meals. 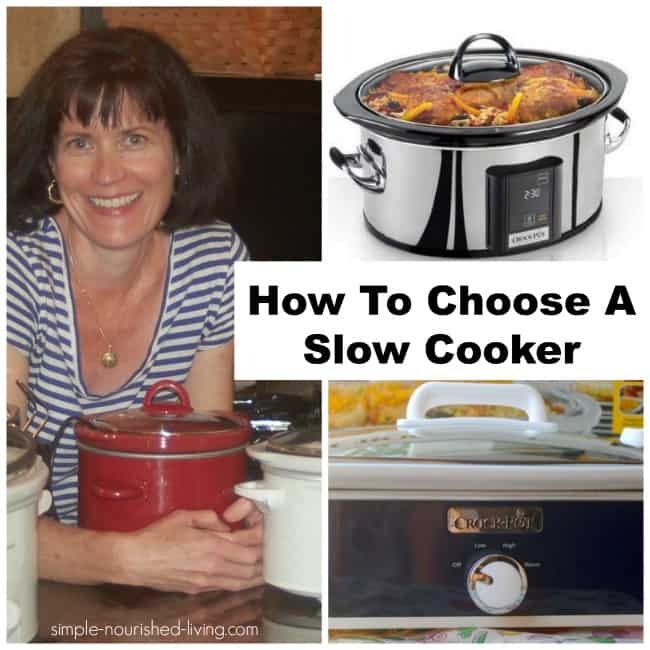 You could easily make a half batch in a 4-quart slow cooker (affiliate link) if you prefer. 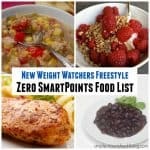 According to my calculations, each serving has about 257 calories, *6 Weight Watchers PointsPlus, *4 SmartPoints. Following the Freestyle Plan, this is now *2 WW Freestyle SmartPoints. This recipe is almost, but not quite, Simply Filling because of the chicken thighs. 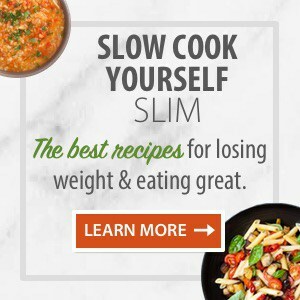 Unfortunately, chicken breasts are NOT a good substitute here because they become too dry and stringy when cooked more than 4 to 6 hours in my slow cooker. We both really enjoyed this dish a lot! I shared with Mom who liked it too. 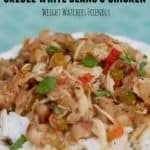 Easy, healthy, satisfying and flavorful, we really enjoyed these slow cooker Creole White Beans with Chicken recipe. It's one we were happy to eat several times during the week. Serve in a bowl like chile or over rice. Place the beans in a large bowl and cover with water. Soak the beans overnight (8 hours) in the refrigerator OR, place the beans in a large pot, cover with water, and bring to a boil over high heat. Boil for one minute, turn the heat off and let the beans sit, covered, for one hour. Drain the beans in a colander. Place the drained beans in your slow cooker. Add the garlic, onion, celery, bell pepper and half the parsley. (Save the rest for garnishing at the end.) Stir to combine. Nestle the chicken thighs down into the sautéed vegetables. Add the Creole seasoning, oregano, smoked paprika, some cracked black pepper, and 6 - 7 cups of water. Stir gently to distribute the spices, but not to disturb the thighs. Remove the chicken thighs and use two forks to shred the meat. Use a large wooden spoon to smash some of the beans against the side of the slow cooker to help the liquid thicken a bit. Taste the beans and adjust the salt and/or Creole seasoning if desired. Return the shredded chicken to the pot and top with fresh chopped parsley. Serve alone or over a bed of rice. 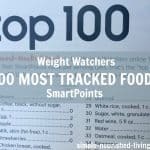 Do you have the nutritional info to update the PointsPlus value to SmartPoints? 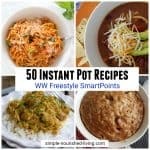 Hi Tiffany, I just ran the ingredients through WW Recipe Builder and was excited to discover this has only 4 SmartPoints!! The recipe says to nestle the chicken thighs down into the sautéed vegetables. Should we sautee the veggies first?